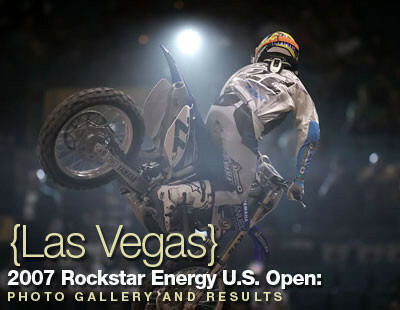 Chad Reed swept the table on Friday night at the Rockstar Energy U.S. Open in Las Vegas, grabbing the fastest time in Superpole qualifying, winning his heat race, taking the holeshot in the main, and the win there as well. That sets him up for a possible $250,000 payday if he can do the same thing again on Saturday night. Behind Chad in the main event were Team Yamaha's Grant Langston, and Team Honda's Andrew Short. The format for this year combined the 250Fs with the 450s, and Aussie newcomer Dan Reardon was the top finisher among the smaller-bore bikes, in sixth spot. Team Kawasaki's James Stewart had run in both practice sessions, but withdrew from the event late in the afternoon citing a lack of preparation time following his knee surgery. You can click the following link to check out quotes from James Stewart about his decision to not race. Check the links above for much more information, both for the race itself, and the action in the pits before the race, and don't forget to check back on Saturday for more from the U.S. Open.